The Emerald Crab also called the mithrax crab or, the green clinging crab, is a species of small saltwater crabs found in a very limited range in the Caribbean Sea. These crabs are highly popular as aquarium pets and are sold almost everywhere around the world. Size: Grows up to a length of about 4 cm (1.6 in). Body Color: Dark green, but can have streaks in dark red, blue, white, gray, or black. Carapace: Flat, shiny, and longer than its width. Feet and Claws: Four pairs of legs like other species, while the chelae (claws) are spoon-shaped with white markings on the tips. Eyes: A pair of protruding eyes like most crab species, located above the mouth. Sexual Dimorphism: Difficult to determine the differences between male and female. The emerald crabs are native to the tropical Caribbean reefs in the Gulf of Mexico. 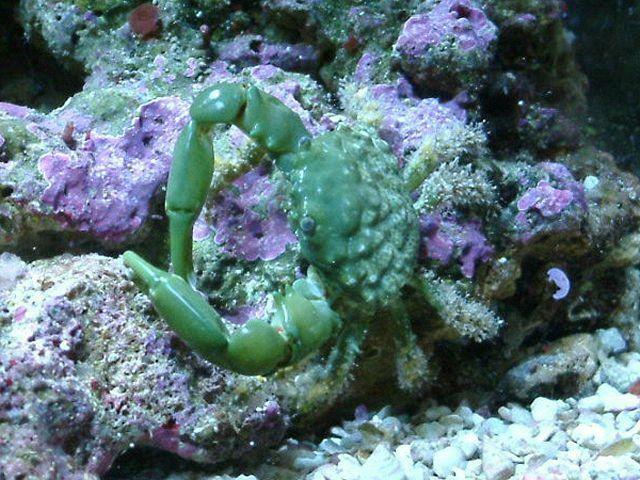 The emerald crabs mostly dwell inside the caves and crevices, as also, under the rocks, when they are not foraging. These crabs are entirely nocturnal and are active all night searching for food. During the day, they usually stay hidden in cracks and corners. They can tolerate all kinds of temperature variations. In the wild, they are frequently seen clinging to the branches of corals, like the finger coral, feasting upon the polyps. 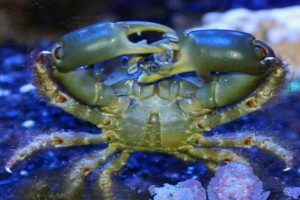 While feeding, they use their two claws alternately, collecting a scrap of the polyp with one, and supplying with the other. These saltwater invertebrates are voracious eaters and would gather and eat up to ten polyps in one minute. Like most other species, these crabs are seen molting from time to time, which is a delicate process. When attacked or touched, they usually take refuge under the tentacles of sun anemones. Emerald crabs engage in mating like other crab species with the male climbing on top of the female. The female does not lay eggs, but carry these in a pouch located under the belly. When the time for releasing the baby crabs sets in, it climbs up to a high point and opens the pouch to release the babies. The newborn crabs feed on tiny microbes and various other algae. The female usually stays close to the young ones until they grow enough to scavenge for themselves. 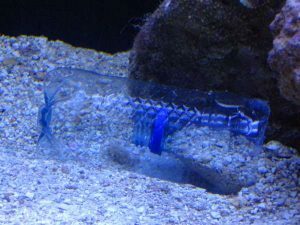 They have the ability to withstand all temperatures and strong currents since they are able to use their legs to cling on to the substrate. Their emerald body color helps them camouflage amidst the underwater plant life. 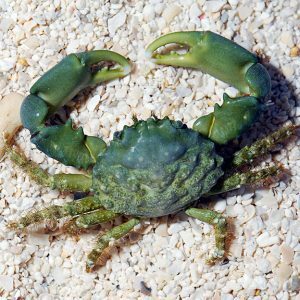 By virtue of their natural instinct, crabs are scavengers, and in the wild, they have been seen consuming the leftovers and remains of meaty foods. They have also been seen consuming polyps, corals, and the organisms that encrust the leaf blades of turtle grass. 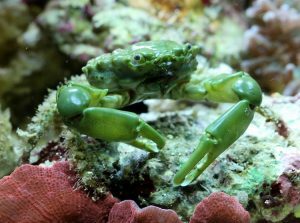 The Emerald Crab can reside within regions of the ocean where other invertebrates face troubles tolerating the ambiance for one reason or the other. 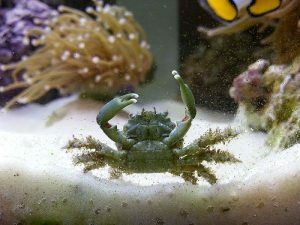 These crabs are famous for their scavenging skills and are often used as a medium in marine fish tanks since they help keep the aquariums clean by consuming algae, like the green hair algae, and the infamous bubble algae. 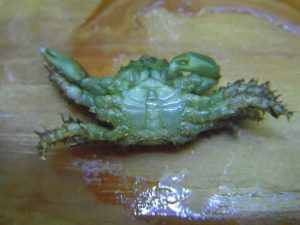 These crabs are so abundant within their habitat that as many as 24 individuals might be found within an area of about 9 square feet.